ROGER KIMBALL: Radical evil, and the online lynching of a kid from Kentucky. 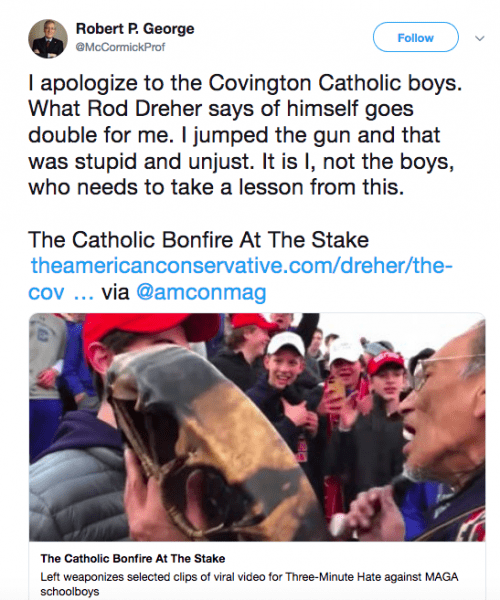 Will journalists apologize if their portrayal of the Covington students vs Indian Elder incident turns out to have been wildly wrong? Total non-sequitur of a question. When is the DNC-MSM ever wrong? UPDATE (FROM GLENN): When do they ever apologize? (Except to offended lefties, that is). Maybe the reason journalists assume that James O’Keefe’s videos are deceptively edited is that deceptive editing is the ordinary course of business for them. This guy hasn’t apologized yet, though. People on the right need to be more skeptical of this kind of thing, rather than rushing to jump on the “we’re better than that” (by which they really mean “I’m better than that”) bandwagon. Lefties rely on that to give momentum to their hit pieces. Instead, hold back and wait for facts to develop. Often — possibly more often than not — the facts will show things to be different than they first appeared. Also, I see that NRO’s big dump on the Covington boys now returns a Page Not Found. Why doesn’t it return an apology for jumping the gun? Or maybe it should just go to this Kyle Smith piece: Nathan Phillips Lied. The Media Bought It. Including NRO. But the media didn’t just buy it. They were co-conspirators. Stand up to bigotry: Support Amy Coney Barrett! NRO needs a full, sincere apology here, and better behavior in the future. I mean, otherwise what do they bring to the table? CNN will already call people on the right bigots for free. NRO piled on the people they should have been protecting, out of a cowardly reflex to assume the worst and isolate the people the media were attacking. They should have looked into the story first, rather than relying on the word of people they should have known were untrustworthy. It was just two days ago that CNN was hyping the Buzzfeed “scoop.” Gateway Pundit is all over this story — and more creditably than NRO. You can’t trust what the likes of CNN and Buzzfeed say about people on the right. You absolutely need to do your own due diligence before piling on. And for the record, here’s the archive version of the now-deleted NRO piece by Nicholas Frankovich The Covington Students Might as Well Have Just Spit on the Cross. 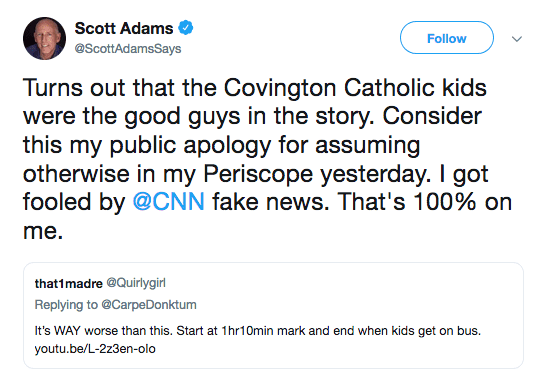 Related: The Media Wildly Mischaracterized That Video of Covington Catholic Students Confronting a Native American Veteran. A bogus story about Trump supporters. Who could imagine such a thing? They deserve an apology. People who owed them fairness and consideration chose virtue-signaling instead.